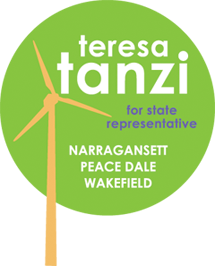 I am writing this letter in support of Teresa Tanzi, a Democratic candidate for state representative in District 34. In an important election year such as this, the September 14th Primary is the “big” race in District 34. The representatives we send to the state house this fall will be responsible for determining our state budget, and will therefore affect our schools, our environment, our social services, and the general quality of life of Rhode Islanders. I trust Teresa to represent my district because of her high level of engagement in the community, her progressive politics, and her approach to solving problems. Teresa’s platform focuses on improving the overall health of our community- encompassing issues such as economic development, high quality public education, fair taxation, renewable energy, solutions to poverty in our community, and government transparency. In keeping with these values, she is involved in the Broad Rock Community Garden, the Jonnycake Center, and South Kingstown Economic Development Committee. However, it is Teresa’s experience as an activist that really distinguishes her. She has spent a large portion of her life organizing and advocating and deeply understands the value of collaboration in improving a community. Teresa is a great voice for South County because she is profoundly invested in the community, is well acquainted with the issues facing our district and state, and is not content to wait for these problems to be solved by others. Furthermore, Teresa’s opponent, incumbent David Caprio, is a lawyer with little advocacy and activism experience who spends much of his time in Providence. Rep. Caprio has lost touch with our community values. This is demonstrated in his recent legislative decisions, such as voting to cut aid to schools and raise the car tax. Teresa’s candidacy represents an opportunity to improve our representation in Providence, ensure that our legislators share our community values, and strengthen South County.